Since I’m such a foodie, people always tend to think I know what I want to eat. WRONG!!!! If you ask me what I want to eat, I’ll tell you good food. A few weeks back, [a friend] asked/insisted that I pick a spot for dinner. I said seafood and she suggested Steamhouse Lounge…..Ladies and Gents…if you’re looking for good seafood, A LOT of good seafood for a cheap price, please venture over to Stemhouse Lounge on West Peachtree St.
Steamhouse Lounge is that random blue house on West Peachtree St at 11th St. There are 2 bars (one upstairs and one downstairs). It reminds me of a seafood spot you’d find close to the beach. The staff is very friendly. I didn’t have any alcoholic beverages this night (it was a Sunday night) but the water with lemons was on point!!! I ordered the fried pickles and the fish and chips. 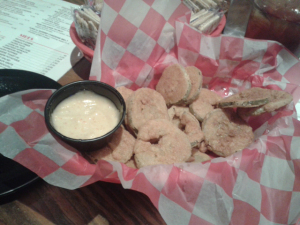 The fried pickles had a tasty batter and were not too salty. They were served with a “tiger sauce”. I don’t know what that it but it was yummy!!! The fish and chips included 2 LARGE beer battered tilapia fillets with crinkle cut fries, hush puppies, tarter and cocktail sauce. Everything was hot and fresh. I waited about 30 minutes for the food (probably because I ordered an appetizer). The hush puppies had the right amount of sweetness. The fries were perfectly seasoned. 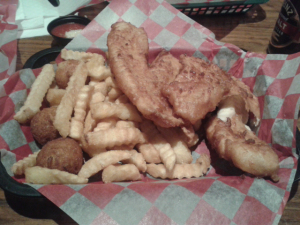 The fish was lightly seasoned and was delightful when paired with the tarter sauce. They even had regular hot sauce!!!! I hate going to a restaurant and the only hot sauce they have is Tabasco. Ugh….I just want regular hot sauce. If you can’t tell, I love this place!!!!! I’ve only been once but I promise you, I’ll be going back again.